Rainbow, brown, cutthroat, and brook are the varieties of trout found in the Blue river and the numerous, professionally managed spring-fed ponds found on the Ranch. DESCRIPTION: As long as 40”, weighing up to 40 lbs. Elongated, spindle-shaped. Freshwater species have prominent black spots on back, distinctive red band on sides. Metallic blue above, silvery-white below. HABITAT: Spring-fed ponds and Blue River. FYI: Spawn in the spring and the average female may produce 1,000 eggs at a time. Much-sought game fish, provides good eating. Rainbow trout were introduced to Colorado in 1882 and have become the most common cold-water game fish in the state. They prefer water in the 50 to 60 degree range, though they can withstand temperatures as high as 85 degrees. Trophy fish in the 10 to 18 pound class are not unheard of in Colorado. DESCRIPTION: As long as 30”, weighing up to 41 lbs. Elongated, cylindrical, moderately flattened from side to side. Back dark olive; sides variable – silvery, olive, reddish to yellow-orange; belly lighter; dark spots on back, sides, and on median fins. Bright red to red-orange slash mark on each side of throat. FYI: These were the only trout found in Colorado when the white man arrived. 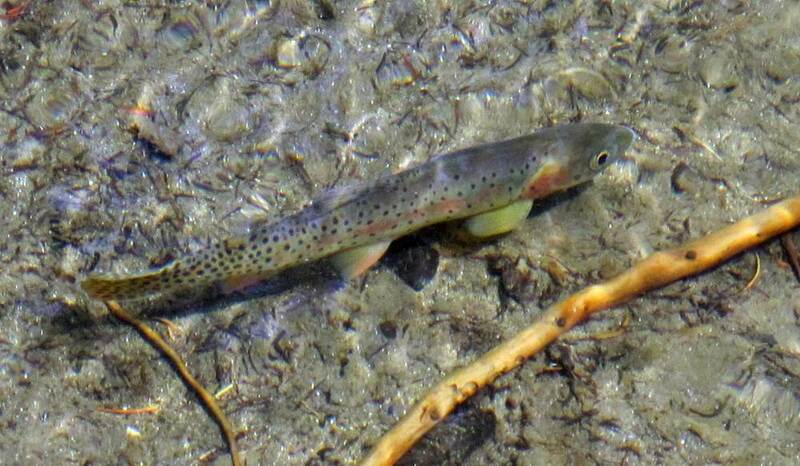 There are more than 10 subspecies of cutthroat trout, locally called “native trout”. They prefer colder waters and typically are found at the very headwaters on high mountain streams and in mountain lakes. DESCRIPTION: As long as 21”, weighing up to 4½ lbs. Elongated, spindle-shaped. Back and sides have red or yellowish tint with lighter wavy lines; sides have red spots within blue halos; belly ordinarily white, reddish in adult males. Fins relatively large. FYI: One of the most colorful freshwater fishes. Typically, they flourish in the high alpine waters of Colorado from 9,000 to 12,000 feet. Brook trout are easily caught with the usual flies and baits and provide considerable fishing for unskilled anglers. Its fighting ability is good and its eating quality excellent.